Lt. Colonel John Sheppard and Dr. Rodney McKay walk into the Atlantis control room. McKay complains that just because he dropped baby Torren, he is no longer permitted to hold him. Chuck the technician announces the sudden presence of a ship in orbit. It’s the Earth battle cruiser Daedalus … which should be en route to Earth. There is no response to a hail because there is no one alive on board. Sheppard’s team takes a Puddle Jumper into orbit to investigate. Noting scorch marks on the Daedalus, they enter the hanger bay — which, curiously, contains only another Jumper. All of the F-302s are missing. McKay and Ronon Dex head for the engineering compartment while Sheppard and Teyla go to the bridge. The ship, normally bustling with crew members, is eerily empty. On the bridge, Teyla brings up the final log entry from Colonel Sobel, commander of the Daedalus. (It’s a surprise to her and Sheppard, since our Daedalus is commanded by Steven Caldwell.) Sobel reports that she is taking the last of the 302s to a planet where the rest of the crew is preparing a settlement. They abandoned the ship, with little hope of rescue. In the meantime, McKay restores basic power to most of the ship. The hyperdrive and subspace communications are damaged beyond repair. The shields are nearly depleted. An odd energy reading spikes. Down on Atlantis, Major Lorne considers launching another Jumper. But suddenly, the Daedalus vanishes. Atlantis is no longer on the planet the Daedalus orbits. McKay traces the energy spike to Deck 9, and realizes what has happened. The ship has jumped to a parallel reality … which explains the duplicates of Sheppard, Ronon, Teyla and McKay that they find lying dead. The residual radiation is identical to that when a parallel Rodney appeared in Atlantis (“McKay and Mrs. Miller”). After stowing the deceased, they locate the alternate reality drive. While McKay studies his counterpart’s data pad, the others search for supplies. McKay worries that if his double couldn’t find a way to get his team home to the proper universe, he won’t either. But he continues the work, as the Daedalus jumps again. This time, Atlantis is again on the surface of the planet below. But the city is under attack by an unknown ship. Sheppard does not hesitate to come to Atlantis’s defense. He fires on the attacking vessel with the Asgard beam weapon, drawing their attention away from the city. When the enemy ship dispatches a wave of vicious fighters, Sheppard and Ronon man the rail guns. Teyla, who Major Marks has taught to operate some of Daedalus‘s systems, apprises them of a hull breach when one of the fighters crashes into the ship. McKay figures out how to charge the alternate reality drive’s capacitor more rapidly, allowing them to jump away from the battle to another parallel universe. The downside is that now they will continue to jump realities more quickly. This time, they orbit a red giant. As they always jump to the same point in space, McKay surmises that this reality’s sun became a red giant much sooner than in their home reality (“The Last Man”). Teyla, Sheppard and Ronon go to Engineering where McKay will guide them in shunting power to the shields so they don’t burn up before the next jump. As Teyla works, Ronon investigates a noise. He is attacked by a powerful alien warrior — no doubt from the alien fighter which crashed into Daedalus and penetrated the hull. Pinned to the ground by his foe, Ronon’s weapon’s fire alters Sheppard, who comes to the rescue. While searching the defeated warrior, they test fire his weapon. This evokes return fire from other alien warriors. More than one alien soldier is on board, and they are technologically advanced and extraordinarily strong. 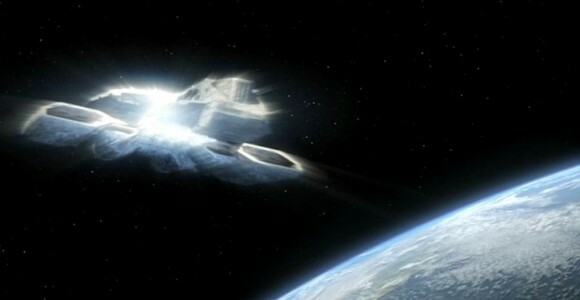 With the hull deteriorating from the solar radiation, McKay decides on a last-ditch gamble and shifts the shield energy to the reality drive capacitor, prompting another jump. The flash from the jump helps Sheppard and Ronon get the jump on the disoriented soldiers and take them out. Once the Daedalus is stabilized — this time in an asteroid field, a universe where the planet was apparently destroyed long ago — McKay realizes he has damaged the drive. They have only a few jumps left before it burns out, stranding them in whatever reality they occupy at the time. Like their counterparts, they could die of a simple lack of supplies. Searching for a solution, he seizes upon Sheppard’s off-handed comment hours ago about throwing the drive into reverse — tracing their path backwards, rather than trying to plot the coordinates to their home reality. But this plan means dealing with the giant sun and the hostile enemy ship again, with minimal power and shields. McKay bypasses the navigational system (which the alternate Rodney failed to do) and the Daedalus jumps backward to the red giant reality. Maneuvering thrusters move the ship just far enough away to save it from the sun’s heat. Before McKay can fix the sublight engines, the drive hurls them back to the reality where Atlantis was under attack. The alien vessel is still there, and it moves in for the kill. When the sublights come online, Sheppard pilots Daedalus away slowly, but the alien ship launches more fighters. Fortunately, a group of F302s, led by this universe’s Lt. Colonel John Sheppard, flies in to the rescue and destroys the fighters in a spectacular dogfight. In this reality, the Daedalus was destroyed two years ago by the Replicators. The two Sheppards compliment one another and agree to part without complicated explanations, and the Daedalus jumps to their first alternate reality, the one with no Atlantis on the planet below. Unfortunately, one more alien soldier from the last reality is still aboard. He ambushes the team as they make their way back to their Jumper, shooting McKay in the arm. The others open fire and, before the alien dies, he detonates an explosive device, decompressing the hanger bay. Now there is no way to return to the Jumper. The team must find another way off the Daedalus when it returns to their home reality, or they will have no way home. The ship suddenly returns to Atlantis’s orbit in our home reality, and Lorne and Dr. Radek Zelenka take a Jumper out to investigate. Since no hyperdrive window opened, they presume it is the ship which Sheppard’s team had boarded. The Jumper reaches the ship’s position, only to witness it jump away again. But there, suited up and drifting in space, are Sheppard, Teyla, Ronon and McKay. Recovering in the infirmary, McKay pours over data on the alternative reality drive. He suggests that he may be able to build one of their own, but Sheppard tells him not to. Teyla stops by with baby Torren, who she allows Rodney to hold. She tells McKay he would make a good father. In the alternate reality from which the Daedalus came, the ship was under the command of a Colonel Sobel — not Colonel Steven Caldwell. Sobel is the first female commander of an Earth battle cruiser we have encountered. This is a more blunt way of making the point that Ronon makes to Teyla: she cannot burden herself by worrying about an infinite number of Baby Torrens in other realities. Rodney speculates that it was an alternate version of himself that originally created the interdimensional drive. He doesn’t necessarily have proof, but believes that he recognizes some of the finesse in its design. In at least one alternate reality (the one in which the team encountered the hostile alien ship), the Daedalus had been destroyed two years ago in a battle with the Replicators. If one season is approximately equal to one year in the Stargate universe, that could indicate that this version of Atlantis encountered and began a conflict with the Replicators a little earlier than we did. While it has been about two years since our team first encountered the Pegasus Galaxy Replicators (the Asurans) (“Progeny”), it’s only been a little over a year since a direct conflict began (“First Strike”), which could have resulted in the destruction of the Daedalus. Rodney has saved a copy of all relevant data on the interdimensional drive, and in theory could build a new one for Atlantis’s use. Sheppard is opposed to the idea, but of course it is entirely possible that Mr. Woolsey or the I.O.A. may feel differently about possessing such a piece of technology. Why did Colonel Sobel and her crew abandon the Daedalus? Where did they settle, and were they ever rescued? Did they knowingly leave the interdimensional drive active? What did the alternate team try to do before they died? Why was their version of McKay not able to figure out how to control the drive? Did the alternate Sheppard recognize the sound of our Sheppard’s voice? Did he figure out that the Daedalus was from a parallel reality? Will anyone else find the Daedalus in another reality? Who are the hostile aliens, and why were they attacking Atlantis? Did the team kill all of the aliens who got on board the ship, or did any manage to survive? Do the aliens exist in our own reality — and is it only a matter of time before we encounter them? Can the same conflict be averted? “It’s a great team show, and it’s a real visual effects spectacular, too. It’s going to be an amazing visual effects show. The idea of that story is the Daedalus just shows up in orbit, unexpectedly. And it doesn’t make sense, because we know for a fact it should be back on Earth. “When we try to radio we receive no response, and when we scan it we learn there are no life signs on board. So we head up to investigate and very quickly find ourselves in trouble because there is a strange energy reading coming from somewhere in the ship. We can’t figure it out, we don’t know where it’s coming from. Suddenly it spikes, a flash consumes the ship, and a moment later, when it dissipates, we learn that Atlantis is gone and we have shifted realities. “So we are essentially on a Flying Dutchman. This drive is caught on auto-pilot, and every time it charges it bursts, and we jump reality after reality after reality after reality. “I spoke with Alan McCullough about Friday’s episode, ‘The Daedalus Variations.’ The working title for this one was ‘The Flying Dutchman,’ which refers to the legend of a ghost ship that can never go home, and is doomed to sail the oceans forever. In this one our intrepid team finds another Daedalus with an inter-dimensional drive that sends them jumping through alternate realities. That’s not a spoiler, by the way, that’s SCI FI’s log line and it’s on the front of this Web site. So don’t blame me for letting the cat out of the bag! “… the original story Alan pitched was about a room in Atlantis that shifts into alternate realities, but that scenario creates issues such as: what if there was no Atlantis in another reality? Would the room simply exist, in that example, in the middle of the ocean? So as you can see that permutation became a bit unwieldy. That is, until Robert Cooper spun it around and suggested using the Daedalus (good with ideas, that guy). And that’s how the story developed. After that little gem of a turn, all the guys had to do was decide what kind of cool stuff the team would run into in the other realities. They had a lot of fun narrowing it down, as you’ll see. “… Alan also said that the writers had some intricate pseudo-scientific discussions regarding the ‘inter-dimensional drive’ when plotting this episode. For example, they had to answer questions such as: what powers the drive? How does it work? How does it malfunction? How will the team fix it? It takes a lot of imagination to create tension for sci-fi in both a plausible and accessible way. McCullough also confirmed that the new alien race won’t be seen again in Season Five. “That was a wonderful team-based story where our heroes have to solve the puzzle of how to get themselves back to their own reality, and in the process they encounter a new and dangerous enemy. “We initially thought about creating different visual cues and changing the whole esthetic look when Sheppard and his team jumped into each timeline, but in the end it didn’t really make sense to do that. Ultimately, the only thing that ‘changes’ are the situations they’re put in. In one reality the ship is boarded by aliens, while in another they’re getting incredibly close to a sun-like planet and the Daedalus is at risk of burning up, and then the ship jumps into an asteroid belt. There’s a VFX for the actual jumping transitions, which we began just by using a big bright light on the set, but then the VFX took over from there and created the transition that got us from one place to the next. VOTE! How would you rate Atlantis's "The Daedalus Variations?"